Early releases of Samba-3 implemented new capability to work concurrently with multiple account backends. This capability was removed beginning with release of Samba 3.0.23. Commencing with Samba 3.0.23 it is possible to work with only one specified passwd backend. The three passdb backends that are fully maintained (actively supported) by the Samba Team are: smbpasswd (being obsoleted), tdbsam (a tdb-based binary file format), and ldapsam (LDAP directory). Of these, only the ldapsam backend stores both POSIX (UNIX) and Samba user and group account information in a single repository. The smbpasswd and tdbsam backends store only Samba user accounts. This isn't really a backend at all, but is listed here for simplicity. Samba can be configured to pass plaintext authentication requests to the traditional UNIX/Linux /etc/passwd and /etc/shadow-style subsystems. On systems that have Pluggable Authentication Modules (PAM) support, all PAM modules are supported. The behavior is just as it was with Samba-2.2.x, and the protocol limitations imposed by MS Windows clients apply likewise. Please refer to Technical Information, for more information regarding the limitations of plaintext password usage. This option allows continued use of the smbpasswd file that maintains a plain ASCII (text) layout that includes the MS Windows LanMan and NT-encrypted passwords as well as a field that stores some account information. This form of password backend does not store any of the MS Windows NT/200x SAM (Security Account Manager) information required to provide the extended controls that are needed for more comprehensive interoperation with MS Windows NT4/200x servers. This backend should be used only for backward compatibility with older versions of Samba. It may be deprecated in future releases. There is a password backend option that allows continued operation with an existing OpenLDAP backend that uses the Samba-2.2.x LDAP schema extension. This option is provided primarily as a migration tool, although there is no reason to force migration at this time. This tool will eventually be deprecated. This backend provides a rich database backend for local servers. This backend is not suitable for multiple domain controllers (i.e., PDC + one or more BDC) installations. This provides a rich directory backend for distributed account installation. The new LDAP implementation significantly expands the control abilities that were possible with prior versions of Samba. It is now possible to specify “per-user” profile settings, home directories, account access controls, and much more. Corporate sites will see that the Samba Team has listened to their requests both for capability and greater scalability. Old Windows clients send plaintext passwords over the wire. Samba can check these passwords by encrypting them and comparing them to the hash stored in the UNIX user database. Newer Windows clients send encrypted passwords (LanMan and NT hashes) instead of plaintext passwords over the wire. The newest clients will send only encrypted passwords and refuse to send plaintext passwords unless their registry is tweaked. Many people ask why Samba cannot simply use the UNIX password database. Windows requires passwords that are encrypted in its own format. The UNIX passwords can't be converted to UNIX-style encrypted passwords. Because of that, you can't use the standard UNIX user database, and you have to store the LanMan and NT hashes somewhere else. In addition to differently encrypted passwords, Windows also stores certain data for each user that is not stored in a UNIX user database: for example, workstations the user may logon from, the location where the user's profile is stored, and so on. 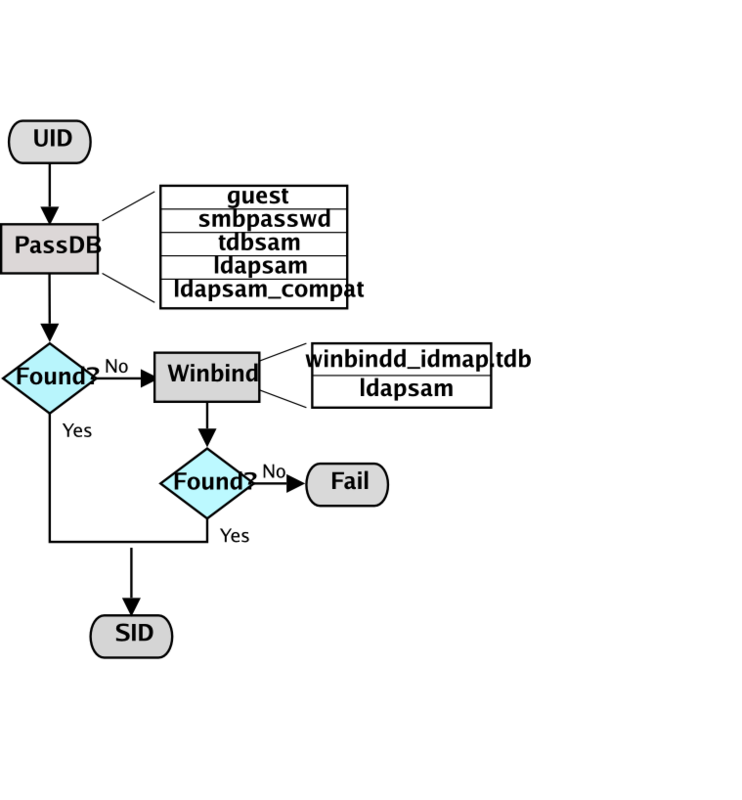 Samba retrieves and stores this information using a passdb backend. Commonly available backends are LDAP, tdbsam, and plain text file. For more information, see the man page for smb.conf regarding the passdb backend parameter. Figure�11.1.�IDMAP: Resolution of SIDs to UIDs. The resolution of SIDs to UIDs is fundamental to correct operation of Samba. In both cases shown, if winbindd is not running or cannot be contacted, then only local SID/UID resolution is possible. See resolution of SIDs to UIDs and resolution of UIDs to SIDs diagrams. Figure�11.2.�IDMAP: Resolution of UIDs to SIDs. The UNIX and SMB password encryption techniques seem similar on the surface. This similarity is, however, only skin deep. The UNIX scheme typically sends clear-text passwords over the network when logging in. This is bad. The SMB encryption scheme never sends the clear-text password over the network, but it does store the 16-byte hashed values on disk. This is also bad. Why? Because the 16 byte hashed values are a “password equivalent.” You cannot derive the user's password from them, but they could potentially be used in a modified client to gain access to a server. This would require considerable technical knowledge on behalf of the attacker but is perfectly possible. You should therefore treat the data stored in whatever passdb backend you use (smbpasswd file, LDAP) as though it contained the clear-text passwords of all your users. Its contents must be kept secret, and the file should be protected accordingly. Ideally, we would like a password scheme that involves neither plaintext passwords on the network nor plaintext passwords on disk. Unfortunately, this is not available because Samba is stuck with having to be compatible with other SMB systems (Windows NT, Windows for Workgroups, Windows 9x/Me). Windows NT 4.0 Service Pack 3 changed the default setting so plaintext passwords are disabled from being sent over the wire. This mandates either the use of encrypted password support or editing the Windows NT registry to re-enable plaintext passwords. MS DOS Network client 3.0 with the basic network redirector installed. Windows 95 with the network redirector update installed. MS Windows XP Home does not have facilities to become a domain member, and it cannot participate in domain logons. The following versions of MS Windows fully support domain security protocols. All current releases of Microsoft SMB/CIFS clients support authentication via the SMB challenge/response mechanism described here. Enabling clear-text authentication does not disable the ability of the client to participate in encrypted authentication. Instead, it allows the client to negotiate either plaintext or encrypted password handling. MS Windows clients will cache the encrypted password alone. Where plaintext passwords are re-enabled through the appropriate registry change, the plaintext password is never cached. This means that in the event that a network connections should become disconnected (broken), only the cached (encrypted) password will be sent to the resource server to effect an auto-reconnect. If the resource server does not support encrypted passwords, the auto-reconnect will fail. Use of encrypted passwords is strongly advised. Plaintext passwords are not passed across the network. Someone using a network sniffer cannot just record passwords going to the SMB server. Plaintext passwords are not stored anywhere in memory or on disk. Windows NT does not like talking to a server that does not support encrypted passwords. It will refuse to browse the server if the server is also in user-level security mode. It will insist on prompting the user for the password on each connection, which is very annoying. The only thing you can do to stop this is to use SMB encryption. Encrypted password support allows automatic share (resource) reconnects. Encrypted passwords are essential for PDC/BDC operation. Plaintext passwords are not kept on disk and are not cached in memory. Plaintext passwords use the same password file as other UNIX services, such as Login and FTP. Use of other services (such as Telnet and FTP) that send plaintext passwords over the network makes sending them for SMB not such a big deal. Every operation in UNIX/Linux requires a user identifier (UID), just as in MS Windows NT4/200x this requires a security identifier (SID). Samba provides two means for mapping an MS Windows user to a UNIX/Linux UID. First, all Samba SAM database accounts require a UNIX/Linux UID that the account will map to. As users are added to the account information database, Samba will call the add user script interface to add the account to the Samba host OS. In essence all accounts in the local SAM require a local user account. 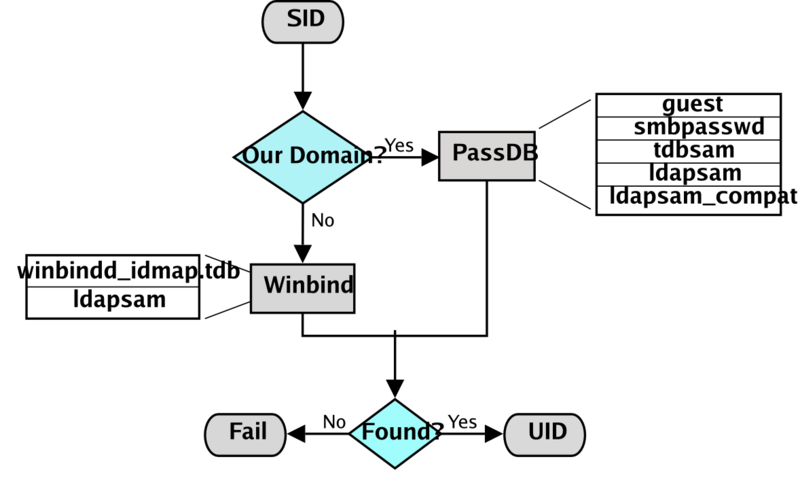 The second way to map Windows SID to UNIX UID is via the idmap uid and idmap gid parameters in smb.conf. Please refer to the man page for information about these parameters. These parameters are essential when mapping users from a remote (non-member Windows client or a member of a foreign domain) SAM server. Samba-3 has a special facility that makes it possible to maintain identical UIDs and GIDs on all servers in a distributed network. A distributed network is one where there exists a PDC, one or more BDCs, and/or one or more domain member servers. Why is this important? This is important if files are being shared over more than one protocol (e.g., NFS) and where users are copying files across UNIX/Linux systems using tools such as rsync. The special facility is enabled using a parameter called idmap backend. The default setting for this parameter is an empty string. Technically it is possible to use an LDAP-based idmap backend for UIDs and GIDs, but it makes most sense when this is done for network configurations that also use LDAP for the SAM backend. Example Configuration with the LDAP idmap Backend shows that configuration. nss_ldap: An LDAP name service switch (NSS) module to provide native name service support for AIX, Linux, Solaris, and other operating systems. This tool can be used for centralized storage and retrieval of UIDs and GIDs. pam_ldap: A PAM module that provides LDAP integration for UNIX/Linux system access authentication. idmap_ad: An IDMAP backend that supports the Microsoft Services for UNIX RFC 2307 schema available from the PADL Web site. There is much excitement and interest in LDAP directories in the information technology world today. The LDAP architecture was designed to be highly scalable. It was also designed for use across a huge number of potential areas of application encompassing a wide range of operating systems and platforms. LDAP technologies are at the heart of the current generations of Federated Identity Management (FIM) solutions that can underlie a corporate Single Sign-On (SSO) environment. LDAP implementations have been built across a wide variety of platforms. It lies at the core of Microsoft Windows Active Directory services (ADS), Novell's eDirectory, as well as many others. Implementation of the directory services LDAP involves interaction with legacy as well as new generation applications, all of which depend on some form of authentication services. UNIX services can utilize LDAP directory information for authentication and access controls through intermediate tools and utilities. The total environment that consists of the LDAP directory and the middle-ware tools and utilities makes it possible for all user access to the UNIX platform to be managed from a central environment and yet distributed to wherever the point of need may be physically located. Applications that benefit from this infrastructure include: UNIX login shells, mail and messaging systems, quota controls, printing systems, DNS servers, DHCP servers, and also Samba. Many sites are installing LDAP for the first time in order to provide a scalable passdb backend for Samba. Others are faced with the need to adapt an existing LDAP directory to new uses such as for the Samba SAM backend. Whatever your particular need and attraction to Samba may be, decisions made in respect of the design of the LDAP directory structure and its implementation are of a durable nature for the site. These have far-reaching implications that affect long-term information systems management costs. Do not rush into an LDAP deployment. Take the time to understand how the design of the Directory Information Tree (DIT) may impact current and future site needs, as well as the ability to meet them. The way that Samba SAM information should be stored within the DIT varies from site to site and with each implementation new experience is gained. It is well understood by LDAP veterans that first implementations create awakening, second implementations of LDAP create fear, and third-generation deployments bring peace and tranquility. Samba requires UNIX POSIX identity information as well as a place to store information that is specific to Samba and the Windows networking environment. The most used information that must be dealt with includes: user accounts, group accounts, machine trust accounts, interdomain trust accounts, and intermediate information specific to Samba internals. The example deployment guidelines in this book, as well as other books and HOWTO documents available from the internet may not fit with established directory designs and implementations. The existing DIT may not be able to accommodate the simple information layout proposed in common sources. Additionally, you may find that the common scripts and tools that are used to provision the LDAP directory for use with Samba may not suit your needs. It is not uncommon, for sites that have existing LDAP DITs to find necessity to generate a set of site-specific scripts and utilities to make it possible to deploy Samba within the scope of site operations. The way that user and group accounts are distributed throughout the DIT may make this a challenging matter. The solution will, of course, be rewarding, but the journey to it may be challenging. Take time to understand site needs and do not rush into deployment. Above all, do not blindly use scripts and tools that are not suitable for your site. Check and validate all scripts before you execute them to make sure that the existing infrastructure will not be damaged by inadvertent use of an inappropriate tool. Samba doesn't provide a turnkey solution to LDAP. It is best to deal with the design and configuration of an LDAP directory prior to integration with Samba. A working knowledge of LDAP makes Samba integration easy, and the lack of a working knowledge of LDAP can make it a frustrating experience. Computer (machine) accounts can be placed wherever you like in an LDAP directory subject to some constraints that are described in this chapter. The POSIX and sambaSamAccount components of computer (machine) accounts are both used by Samba. Thus, machine accounts are treated inside Samba in the same way that Windows NT4/200X treats them. A user account and a machine account are indistinquishable from each other, except that the machine account ends in a $ character, as do trust accounts. The need for Windows user, group, machine, trust, and other accounts to be tied to a valid UNIX UID is a design decision that was made a long way back in the history of Samba development. It is unlikely that this decision will be reversed or changed during the remaining life of the Samba-3.x series. The resolution of a UID from the Windows SID is achieved within Samba through a mechanism that must refer back to the host operating system on which Samba is running. The NSS is the preferred mechanism that shields applications (like Samba) from the need to know everything about every host OS it runs on. Samba asks the host OS to provide a UID via the “passwd”, “shadow”, and “group” facilities in the NSS control (configuration) file. The best tool for achieving this is left up to the UNIX administrator to determine. It is not imposed by Samba. Samba provides winbindd with its support libraries as one method. It is possible to do this via LDAP, and for that Samba provides the appropriate hooks so that all account entities can be located in an LDAP directory. Samba provides two tools for management of user and machine accounts: smbpasswd and pdbedit. The pdbedit can be used to manage account policies in addition to Samba user account information. The policy management capability is used to administer domain default settings for password aging and management controls to handle failed login attempts. Some people are confused when reference is made to smbpasswd because the name refers to a storage mechanism for SambaSAMAccount information, but it is also the name of a utility tool. That tool is destined to eventually be replaced by new functionality that is being added to the net toolset (see the Net Command. The smbpasswd utility is similar to the passwd and yppasswd programs. It maintains the two 32 byte password fields in the passdb backend. This utility operates independently of the actual account and password storage methods used (as specified by the passdb backend in the smb.conf file. smbpasswd works in a client-server mode where it contacts the local smbd to change the user's password on its behalf. This has enormous benefits. smbpasswd has the capability to change passwords on Windows NT servers (this only works when the request is sent to the NT PDC if changing an NT domain user's password). add user or machine accounts. delete user or machine accounts. enable user or machine accounts. disable user or machine accounts. set to NULL user passwords. For secret, type the old value here or press return if there is no old password. If the old value does not match the current value stored for that user, or the two new values do not match each other, then the password will not be changed. When invoked by an ordinary user, the command will allow only the user to change his or her own SMB password. When run by root, smbpasswd may take an optional argument specifying the username whose SMB password you wish to change. When run as root, smbpasswd does not prompt for or check the old password value, thus allowing root to set passwords for users who have forgotten their passwords. smbpasswd is designed to work in the way familiar to UNIX users who use the passwd or yppasswd commands. While designed for administrative use, this tool provides essential user-level password change capabilities. For more details on using smbpasswd, refer to the man page (the definitive reference). Who has access to information systems that store financial data. How personal and financial information is treated among employees and business partners. How security vulnerabilities are managed. Security and patch level maintenance for all information systems. How information systems changes are documented and tracked. How information access controls are implemented and managed. Auditability of all information systems in respect of change and security. Disciplinary procedures and controls to ensure privacy. In short, the Sarbanes-Oxley Act of 2002 is an instrument that enforces accountability in respect of business related information systems so as to ensure the compliance of all information systems that are used to store personal information and particularly for financial records processing. Similar accountabilities are being demanded around the world. The need to be familiar with the Samba tools and facilities that permit information systems operation in compliance with government laws and regulations is clear to all. The pdbedit is currently the only Samba tool that provides the capacity to manage account and systems access controls and policies. During the remaining life-cycle of the Samba-3 series it is possible the new tools may be implemented to aid in this important area. Domain global policy controls available in Windows NT4 compared with Samba is shown in NT4 Domain v's Samba Policy Controls. The pdbedit tool is the only one that can manage the account security and policy settings. It is capable of all operations that smbpasswd can do as well as a superset of them. One particularly important purpose of the pdbedit is to allow the import/export of account information from one passdb backend to another. The pdbedit tool, like the smbpasswd tool, requires that a POSIX user account already exists in the UNIX/Linux system accounts database (backend). Neither tool will call out to the operating system to create a user account because this is considered to be the responsibility of the system administrator. When the Windows NT4 domain user manager is used to add an account, Samba will implement the add user script (as well as the other interface scripts) to ensure that user, group and machine accounts are correctly created and changed. The use of the pdbedit tool does not make use of these interface scripts. Before attempting to use the pdbedit tool to manage user and machine accounts, make certain that a system (POSIX) account has already been created. Microsoft LanManager password hash (password converted to upper-case then hashed. Microsoft NT password hash (hash of the case-preserved password). The LCT data (password last change time). The Account Flags parameters are documented in the pdbedit man page, and are briefly documented in the Account Flags Management section. The LCT data consists of 8 hexadecimal characters representing the time since January 1, 1970, of the time when the password was last changed. The pdbedit can be used to add a user account to a standalone server or to a domain. In the example shown here the account for the user vlaan has been created before attempting to add the SambaSAMAccount. The account is removed without further screen output. The account is removed only from the SambaSAMAccount (passdb backend) database, it is not removed from the UNIX account backend. The use of the NT4 domain user manager to delete an account will trigger the delete user script, but not the pdbedit tool. Refer to the pdbedit man page for a full synopsis of all operations that are available with this tool. Refer to the strptime man page for specific time format information. Please refer to the pdbedit man page for further information relating to SambaSAMAccount management. The Samba SAM account flags are properly called the ACB (account control block) within the Samba source code. In some parts of the Samba source code they are referred to as the account encode_bits, and also as the account control flags. The manual adjustment of user, machine (workstation or server) or an inter-domain trust account account flgas should not be necessary under normal conditions of use of Samba. On the other hand, where this information becomes corrupted for some reason, the ability to correct the damaged data is certainly useful. The tool of choice by which such correction can be affected is the pdbedit utility. There have been a few requests for information regarding the account flags from developers who are creating their own Samba management tools. An example of a need for information regarding the proper management of the account flags is evident when developing scripts that will be used to manage an LDAP directory. The account flag field can contain up to 16 characters. Presently, only 11 are in use. These are listed in Samba SAM Account Control Block Flags. The order in which the flags are specified to the pdbedit command is not important. In fact, they can be set without problem in any order in the SambaAcctFlags record in the LDAP directory. H A home directory is required. I An inter-domain trust account. L Account has been auto-locked. M An MNS (Microsoft network service) logon account. S A server trust account. T Temporary duplicate account entry. U A normal user account. W A workstation trust account. X Password does not expire. bad lockout attempt = 8 bad logon attempts. lockout duration = forever, account must be manually reenabled. To set the maximum (infinite) lockout time use the value of -1. Account policies must be set individually on each PDC and BDC. At this time (Samba 3.0.11 to Samba 3.0.14a) account policies are not replicated automatically. This may be fixed before Samba 3.0.20 ships or some time there after. Please check the WHATSNEW.txt file in the Samba-3 tarball for specific update notiations regarding this facility. Replace the smbpasswd with tdbsam in the passdb backend configuration in smb.conf. Samba offers flexibility in backend account database design. The flexibility is immediately obvious as one begins to explore this capability. Recent changes to Samba (since 3.0.23) have removed the mulitple backend feature in order to simplify problems that broke some installations. This removal has made the internal operation of Samba-3 more consistent and predictable. Beginning with Samba 3.0.23 it is no longer possible to specify use of mulitple passdb backends. Earlier versions of Samba-3 made it possible to specify multiple password backends, and even multiple backends of the same type. The multiple passdb backend capability caused many problems with name to SID and SID to name ID resolution. The Samba team wrestled with the challenges and decided that this feature needed to be removed. Older versions of Samba retrieved user information from the UNIX user database and eventually some other fields from the file /etc/samba/smbpasswd or /etc/smbpasswd. When password encryption is disabled, no SMB-specific data is stored at all. Instead, all operations are conducted via the way that the Samba host OS will access its /etc/passwd database. On most Linux systems, for example, all user and group resolution is done via PAM. Traditionally, when configuring encrypt passwords = yes in Samba's smb.conf file, user account information such as username, LM/NT password hashes, password change times, and account flags have been stored in the smbpasswd(5) file. There are several disadvantages to this approach for sites with large numbers of users (counted in the thousands). The first problem is that all lookups must be performed sequentially. Given that there are approximately two lookups per domain logon (one during intial logon validation and one for a session connection setup, such as when mapping a network drive or printer), this is a performance bottleneck for large sites. What is needed is an indexed approach such as that used in databases. The second problem is that administrators who desire to replicate an smbpasswd file to more than one Samba server are left to use external tools such as rsync(1) and ssh(1) and write custom, in-house scripts. Finally, the amount of information that is stored in an smbpasswd entry leaves no room for additional attributes such as a home directory, password expiration time, or even a relative identifier (RID). As a result of these deficiencies, a more robust means of storing user attributes used by smbd was developed. The API that defines access to user accounts is commonly referred to as the samdb interface (previously, this was called the passdb API and is still so named in the Samba source code trees). Samba provides an enhanced set of passdb backends that overcome the deficiencies of the smbpasswd plaintext database. These are tdbsam and ldapsam. Of these, ldapsam will be of most interest to large corporate or enterprise sites. Samba can store user and machine account data in a “TDB” (trivial database). Using this backend does not require any additional configuration. This backend is recommended for new installations that do not require LDAP. As a general guide, the Samba Team does not recommend using the tdbsam backend for sites that have 250 or more users. Additionally, tdbsam is not capable of scaling for use in sites that require PDB/BDC implementations that require replication of the account database. Clearly, for reason of scalability, the use of ldapsam should be encouraged. The recommendation of a 250-user limit is purely based on the notion that this would generally involve a site that has routed networks, possibly spread across more than one physical location. The Samba Team has not at this time established the performance-based scalability limits of the tdbsam architecture. There are sites that have thousands of users and yet require only one server. One site recently reported having 4,500 user accounts on one UNIX system and reported excellent performance with the tdbsam passdb backend. The limitation of where the tdbsam passdb backend can be used is not one pertaining to a limitation in the TDB storage system, it is based only on the need for a reliable distribution mechanism for the SambaSAMAccount backend. The second item can be accomplished by using LDAP NSS and PAM modules. LGPL versions of these libraries can be obtained from PADL Software. More information about the configuration of these packages may be found in LDAP, System Administration by Gerald Carter, Chapter 6, Replacing NIS". The Samba-PDC-LDAP-HOWTO maintained by Ignacio Coupeau. The NT migration scripts from IDEALX that are geared to manage users and groups in such a Samba-LDAP domain controller configuration. Idealx also produced the smbldap-tools and the Interactive Console Management tool. The LDAP ldapsam code was developed and tested using the OpenLDAP 2.x server and client libraries. The same code should work with Netscape's Directory Server and client SDK. However, there are bound to be compile errors and bugs. These should not be hard to fix. Please submit fixes via the process outlined in Reporting Bugs. Samba is capable of working with any standards-compliant LDAP server. The samba.schema file has been formatted for OpenLDAP 2.0/2.1. The Samba Team owns the OID space used by the above schema and recommends its use. If you translate the schema to be used with Netscape DS, please submit the modified schema file as a patch to jerry@samba.org. Just as the smbpasswd file is meant to store information that provides information additional to a user's /etc/passwd entry, so is the sambaSamAccount object meant to supplement the UNIX user account information. A sambaSamAccount is an AUXILIARY ObjectClass, so it can be used to augment existing user account information in the LDAP directory, thus providing information needed for Samba account handling. However, there are several fields (e.g., uid) that overlap with the posixAccount ObjectClass outlined in RFC 2307. This is by design. In order to store all user account information (UNIX and Samba) in the directory, it is necessary to use the sambaSamAccount and posixAccount ObjectClasses in combination. However, smbd will still obtain the user's UNIX account information via the standard C library calls, such as getpwnam(). This means that the Samba server must also have the LDAP NSS library installed and functioning correctly. This division of information makes it possible to store all Samba account information in LDAP, but still maintain UNIX account information in NIS while the network is transitioning to a full LDAP infrastructure. To include support for the sambaSamAccount object in an OpenLDAP directory server, first copy the samba.schema file to slapd's configuration directory. The samba.schema file can be found in the directory examples/LDAP in the Samba source distribution. Next, include the samba.schema file in slapd.conf. The sambaSamAccount object contains two attributes that depend on other schema files. The uid attribute is defined in cosine.schema and the displayName attribute is defined in the inetorgperson.schema file. Both of these must be included before the samba.schema file. The userPassword shown above should be generated using slappasswd. The following command will then load the contents of the LDIF file into the LDAP database. Do not forget to secure your LDAP server with an adequate access control list as well as an admin password. If the build of the smbd command you are using does not produce output that includes HAVE_LDAP_H it is necessary to discover why the LDAP headers and libraries were not found during compilation. These are described in the smb.conf man page and so are not repeated here. However, an example for use with an LDAP directory is shown in the Configuration with LDAP. # Define the DN used when binding to the LDAP servers. # passphrase in the secrets.tdb file. # If the "ldap admin dn" value changes, it must be reset. ldap admin dn = "cn=Manager,dc=quenya,dc=org"
Because user accounts are managed through the sambaSamAccount ObjectClass, you should modify your existing administration tools to deal with sambaSamAccount attributes. Machine accounts are managed with the sambaSamAccount ObjectClass, just like user accounts. However, it is up to you to store those accounts in a different tree of your LDAP namespace. You should use “ou=Groups,dc=quenya,dc=org” to store groups and “ou=People,dc=quenya,dc=org” to store users. Just configure your NSS and PAM accordingly (usually, in the /etc/openldap/sldap.conf configuration file). In Samba-3, the group management system is based on POSIX groups. This means that Samba makes use of the posixGroup ObjectClass. For now, there is no NT-like group system management (global and local groups). Samba-3 knows only about Domain Groups and, unlike MS Windows 2000 and Active Directory, Samba-3 does not support nested groups. There are two important points to remember when discussing the security of sambaSAMAccount entries in the directory. Never retrieve the SambaLMPassword or SambaNTPassword attribute values over an unencrypted LDAP session. Never allow non-admin users to view the SambaLMPassword or SambaNTPassword attribute values. These password hashes are clear-text equivalents and can be used to impersonate the user without deriving the original clear-text strings. For more information on the details of LM/NT password hashes, refer to the Account Information Database section. To remedy the first security issue, the ldap ssl smb.conf parameter defaults to require an encrypted session (ldap ssl = on) using the default port of 636 when contacting the directory server. When using an OpenLDAP server, it is possible to use the StartTLS LDAP extended operation in the place of LDAPS. In either case, you are strongly encouraged to use secure communications protocols (so do not set ldap ssl = off). Note that the LDAPS protocol is deprecated in favor of the LDAPv3 StartTLS extended operation. However, the OpenLDAP library still provides support for the older method of securing communication between clients and servers. The sambaSamAccount ObjectClass is composed of the attributes shown in next tables: Part A, and Part B.
sambaLMPassword The LanMan password 16-byte hash stored as a character representation of a hexadecimal string. sambaNTPassword The NT password 16-byte hash stored as a character representation of a hexadecimal string. sambaPwdLastSet The integer time in seconds since 1970 when the sambaLMPassword and sambaNTPassword attributes were last set. sambaAcctFlags String of 11 characters surrounded by square brackets [ ] representing account flags such as U (user), W (workstation), X (no password expiration), I (domain trust account), H (home dir required), S (server trust account), and D (disabled). sambaLogonTime Integer value currently unused. sambaLogoffTime Integer value currently unused. sambaKickoffTime Specifies the time (UNIX time format) when the user will be locked down and cannot login any longer. If this attribute is omitted, then the account will never expire. Using this attribute together with shadowExpire of the shadowAccount ObjectClass will enable accounts to expire completely on an exact date. sambaPwdCanChange Specifies the time (UNIX time format) after which the user is allowed to change his password. If this attribute is not set, the user will be free to change his password whenever he wants. sambaPwdMustChange Specifies the time (UNIX time format) when the user is forced to change his password. If this value is set to 0, the user will have to change his password at first login. If this attribute is not set, then the password will never expire. sambaHomeDrive Specifies the drive letter to which to map the UNC path specified by sambaHomePath. The drive letter must be specified in the form “X:” where X is the letter of the drive to map. Refer to the “logon drive” parameter in the smb.conf(5) man page for more information. sambaLogonScript The sambaLogonScript property specifies the path of the user's logon script, .CMD, .EXE, or .BAT file. The string can be null. The path is relative to the netlogon share. Refer to the logon script parameter in the smb.conf man page for more information. sambaProfilePath Specifies a path to the user's profile. This value can be a null string, a local absolute path, or a UNC path. Refer to the logon path parameter in the smb.conf man page for more information. sambaHomePath The sambaHomePath property specifies the path of the home directory for the user. The string can be null. If sambaHomeDrive is set and specifies a drive letter, sambaHomePath should be a UNC path. The path must be a network UNC path of the form \\server\share\directory. This value can be a null string. Refer to the logon home parameter in the smb.conf man page for more information. sambaUserWorkstations Here you can give a comma-separated list of machines on which the user is allowed to login. You may observe problems when you try to connect to a Samba domain member. Because domain members are not in this list, the domain controllers will reject them. Where this attribute is omitted, the default implies no restrictions. sambaSID The security identifier(SID) of the user. The Windows equivalent of UNIX UIDs. sambaPrimaryGroupSID The security identifier (SID) of the primary group of the user. sambaDomainName Domain the user is part of. These attributes are only stored with the sambaSamAccount entry if the values are non-default values. For example, assume MORIA has now been configured as a PDC and that logon home = \\%L\%u was defined in its smb.conf file. When a user named “becky” logs on to the domain, the logon home string is expanded to \\MORIA\becky. If the smbHome attribute exists in the entry “uid=becky,ou=People,dc=samba,dc=org”, this value is used. However, if this attribute does not exist, then the value of the logon home parameter is used in its place. Samba will only write the attribute value to the directory entry if the value is something other than the default (e.g., \\MOBY\becky). Samba-3 and later can update the non-Samba (LDAP) password stored with an account. When using pam_ldap, this allows changing both UNIX and Windows passwords at once. The ldap passwd sync options can have the values shown in Possible ldap passwd sync Values. When the user changes his password, update SambaNTPassword, SambaLMPassword, and the password fields. Only update SambaNTPassword and SambaLMPassword. Only update the LDAP password and let the LDAP server worry about the other fields. This option is only available on some LDAP servers and only when the LDAP server supports LDAP_EXOP_X_MODIFY_PASSWD. More information can be found in the smb.conf man page. Howard Chu has written a special overlay called smbk5pwd. This tool modifies the SambaNTPassword, SambaLMPassword and Heimdal hashes in an OpenLDAP entry when an LDAP_EXOP_X_MODIFY_PASSWD operation is performed. The overlay is shipped with OpenLDAP-2.3 and can be found in the contrib/slapd-modules/smbk5pwd subdirectory. This module can also be used with OpenLDAP-2.2. Make sure your user has been added to the current Samba passdb backend. Read the Account Management Tools, for details. When explicitly setting an auth methods parameter, guest must be specified as the first entry on the line for example, auth methods = guest sam.